The novel is extraordinary in every way. It’s a narrative of fragile beauties, luminous insights, mysterious silences – all related in a prose as spare and understated as the dustbowl town itself. And there is plenty here for theologians to think about as well. You wouldn’t be far wrong if you said that the whole novel is an account of the power and beauty of blessing. Our narrator, John Ames, tells us that he became a minister not for any of the usual reasons, but because it gave him the opportunity to confer blessing. When he baptised a family of kittens as a young boy, he discovered that “there is a reality in blessing”: “Everyone has petted a cat, but to touch one like that, with the pure intention of blessing it, is a very different thing…. The sensation is of really knowing a creature, I mean really feeling its mysterious life and your own mysterious life at the same time.” Ames describes this as one of the “advantages” of being a minister: “Not that you have to be a minister to confer blessing. You are simply much more likely to find yourself in that position. It’s a thing people expect of you” (p. 23). To confer blessing – that is the purpose of existence, that is how we honour all those “precious things [that] have been put into our hands” (p. 246). More than that: to confer blessing is required of us; it’s an obligation placed on us as soon as we really encounter another person. Ames remarks: “there is nothing more astonishing than a human face…. It has something to do with incarnation. You feel your obligation to a child when you have seen it and held it. Any human face is a claim on you, because you can’t help but understand the singularity of it, the courage and loneliness of it” (p. 66). It’s fitting, then, that John Ames’ own life should culminate in a simple moment of blessing. Sitting at a dusty old bus stop, he places his hand on Jack Boughton’s brow and blesses him. And he tells us: “I’d have gone through seminary and ordination and all the years intervening for that one moment” (p. 242). 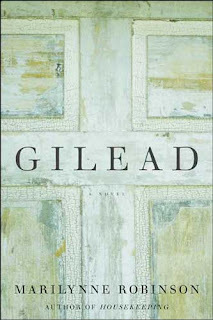 Gilead is itself just such a moment – the novel is a gentle intrusion of grace, a warm hand on your brow, a moment when the world stands still and blessing is conferred.